You’d be pretty discouraged to attend an event at a sports stadium or concert venue only to discover there are no food choices there for you. If you’re vegan, chances are you know this feeling well. 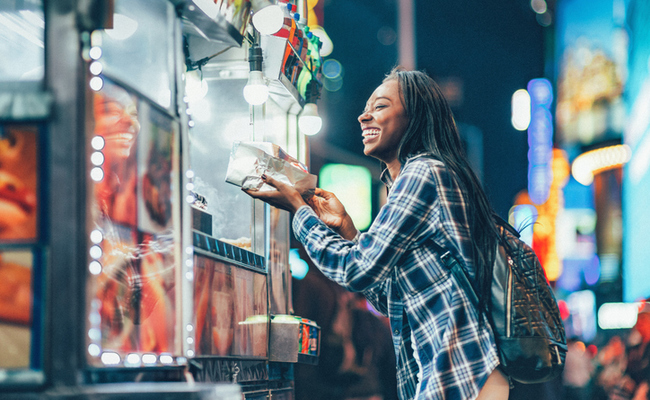 One Los Angeles city council member thinks it’s high time all larger scale or city-run concessionaires that serve food within city limits be required to offer a vegan option. Councilman Paul Koretz introduced a motion on December 5, 2018, asking various city departments to provide input on how this idea could be implemented at large venues like movie theaters, the Los Angeles Zoo, sporting stadiums, city-operated parks and the like. Note that L.A. restaurants are not included in this proposal. Koretz wants Los Angeles International Airport to have at least one vegan restaurant in every terminal. He also hopes to require Meals on Wheels to offer a vegan meal option. Wrote L.A.’s landmark ban on the use of bullhooks to control elephants in training and live performances, approved in 2013. Wrote L.A.’s ban on the sale of mill-bred animals in pet shops. Wrote L.A.’s first requirements to create and preserve wildlife corridors to enhance the safe movement of wild animals while protecting humans in inhabited areas. Wrote L.A.’s ban on the declawing of cats and other animals. Proposed an increase from three to five for the number of cats permitted in individual households. Wrote legislation to explore methods for encouraging more rental housing to become pet-friendly. Such a mandate wouldn’t be a problem for several city venues like the Staples Center and Dodger Stadium. They already offer vegan food. Many movie theaters already offer vegan popcorn made with canola oil instead of butter. There are about 1.62 million vegans in the United States. That’s about 3 percent of all Americans. Another 5 or 6 percent consider themselves vegetarian. However, a fair number of people are (1) trying to eat more healthfully, (2) eating plant-based at least some of the time or (3) dating or hanging out with a vegan, vegetarian or flexitarian. Those people need options at the types of venues Koretz is targeting. “I want to make it easier for us to do better around the City as well as provide more options for people who are already following a plant-based diet,” Koretz said at his press conference. “I wish there was a more vivid way for people to completely understand the connection between the burgers, steaks and dairy that they are eating, the rainforests that are being cut down as a direct result and the fires that are burning down the homes of the neighbors,” he added. I’m truly torn about this proposal. One part of me loves that it would improve access to vegan food — especially for programs like Meals on Wheels, where users have to take what they can get. Requiring a plant-based option for all city-run concessions doesn’t bother me much, because private enterprise isn’t being infringed. I am a little bothered by the idea of requiring movie theaters or other privately owned venues to comply. Yes, even here I’d love the increased options — but perhaps the market should decide what food this sort of place will offer. Plant-based eating is becoming popular enough that demand ought to dictate what happens. As Councilman Koretz noted at his press conference, “Any restaurant that doesn’t serve vegan food is burning money.” These days — especially in L.A. — he’s right. It’s their money, though. Let non-municipal entities come to that realization themselves. Tweak this proposal to require only city-operated venues and programs to adopt this plan and I’m behind it. What do you think about Councilman Koretz’s proposal? Tell us in the comments.